LAST UPDATE: Saturday 14 January, 2017. Warnie has posted his article on AFL.com.au along with the prices for the Cats. For those keen to start with Todd Goldstein but were worried about sharing ruck time with Majak Daw, it should be okay… at least early on. Daw underwent arthroscopic surgery on Friday but the club expects him to play early in the home-and-away season. The cliche is rolled out at Hawthorn with Luke Hodge “training like a teenager” and Cyril Rioli “enjoying a stellar pre-season”. Also noted is Jack Gunston and Isaac Smith “going to another level” plus Taylor Duryea having “his best preparation since being at the club”. Plenty of cleared blocks out at Waverley with the houses being trained down. Former Pie Marley Williams (DEF, $332K) looks to be impressing on the training track this pre-season with fellow defender Jamie Macmillan complimentary, sounding like Williams will definitely be part of the back six. “(Williams has) been adding a little bit of run and a little bit of drive. A lot of guys have spoken about our backline perhaps lacking that a little bit. He’s certainly bringing that to the table,” Macmillan said. “He adds another dimension. He can also lock down, which is something we’ve probably struggled with, just thinking back to the Adelaide final with Eddie Betts kicking five or six (goals). He also mentioned that Nathan Hrovat (MID/FWD, $380K) is small… well, yeah. But that he expects the two new recruits to play early. Macmillan also said Jy Simpkin (FWD, $228K) could be special, but he has had a limited pre-season after a broken leg earlier in the year playing for his school. As the heading says, expect Jobe Watson to spend more time forward this season. Matthew Lloyd thinks the Bomber will do well inside 50. Another one to mark down on the DPP watch list. Interesting as he is at such a bargain price, is he more valuable now with the potential FWD status he may pick up? NOW | Matthew Lloyd is on the line. "Whispers is on the money. I think Jobe Watson will be more in the forward line than midfield." Calvin has posted his article on AFL.com.au along with the prices for the Giants. Pretty simply out of the Pies, well the news that matters anyway, is that Jamie Elliott (FWD, $330K) impressed on the track coming off the Christmas break. He didn’t play last season, giving him a 30% price discount, after having back surgery to deal with a pars defect injury. Daniel Wells was on light duties – running and kicking the footy – after a calf strain. As Essendon’s midfield returns to its peak, news from the Tullamarine is that Andrew McGrath (DEF/MID, $250K) and Dylan Clarke (MID, $150K) are the draftees who have got through the biggest training load so far. McGrath is training with the defenders, Clark with the midfielders. The interesting piece of this information is that they have only done 50% of the workload compared to Darcy Parish this time last year. This probably says more about Parish, but worth keeping in the back of your mind. Also, for those considering Kobe Mutch (MID, $168K), despite being a ball-magnet as a junior, he is being managed due to a groin injury. The Hawks are being conservative with Jaeger O’Meara (MID, $364K) who has missed the last two seasons with knee issues. It has been reported that he is aiming for a round four debut with his new club. He is still a chance for round one, but with this news, I won’t be starting with the 22-year-old in my Fantasy squad. “It is pretty clear he wants to play as soon as he is ready … if that is in the first couple of months of the season then fantastic. “We were all mindful of what this young man could bring to us. Former Sun Dion Prestia (MID, $561K) performed strongly in a six-minute running drill after being eased in this pre-season. The midfielder underwent knee surgery in July last year and started light skill work today. Dan Butler (FWD, $150K) was among the young players to stand out in the 3km time trial today. At Essendon’s 2km time trial today, Brent Stanton (MID, $574K) led the defenders home. Could he be in the mix for DPP in round six? Roy has posted his article on AFL.com.au along with the prices for the Hawks. The Melbourne training camp was intense judging by the video below, but a main casualty from it was 23-year-old Dom Tyson who “suffered a partial dislocation of his patella tendon”. He should be able to return to full training ahead of the JLT Community series starting mid-February. This news would cross him off any Fantasy Classic list, but would make the midfielder drop a few places in my Draft rankings. West Coast ruckman Nic Naitanui ran today for the first time since surgery on the ACL injured late in the season. He is aiming to play in the later stages of 2017. Maybe consider him mid-season as a free agent pick up for your draft league if the Eagles look to bring him back. Another thing to note in the article are these comments on Jack Redden from assistant coach Justin Longmuir. Some have put a line through the former Fantasy premium, maybe this could change your mind? “I’ve been really impressed with the way he has applied himself,” Longmuir said. “He’s run PB times both times we’ve run 2km (time trials) and that shows that he’s really dedicated himself in his break to become a better footballer. “We’re not forgetting that he came to the footy club banged up – he missed all of the pre-season last year, so that was a really difficult time for him. Although he has been training with the midfield group this pre-season, Brodie Smith believes he will play most of his footy on the half-back and wing. He may, however, spend some time inside. 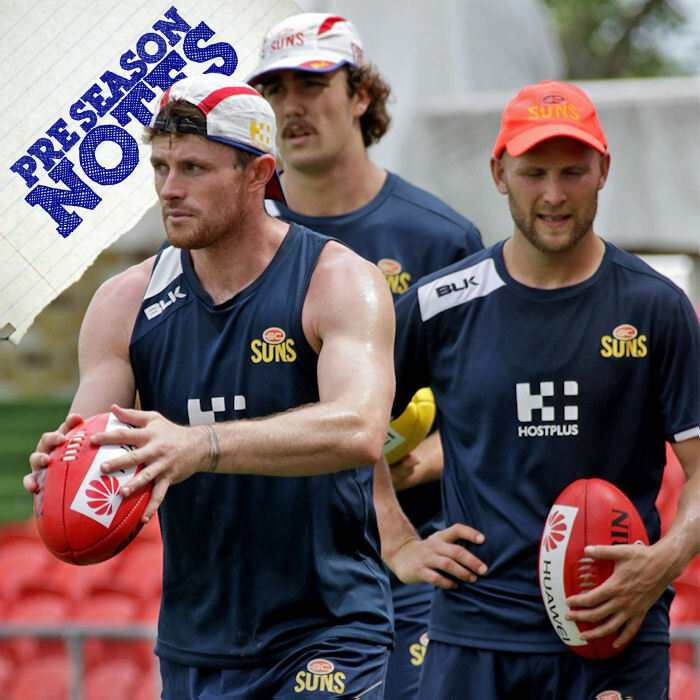 How the Crows line up is a big question of this pre-season with Rory Laird, Curtly Hampton and Scott Thompson being mooted for role changes. Pre-season buzz boy Riley Knight won the 2km time trial on Monday following the Christmas break. Former Giant and new Docker Cam McCarthy pushed himself in match simulation. Not a huge deal? Well, all is looking good for us to grab the $211K FWD for our F6.